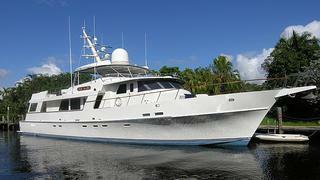 News in from Jim McKee at Gilman Yachts of a $400,000 price drop on the 31.4m Christensen motor yacht Magic Time. Built in 1988, the yacht’s current owner and her two predecessors have upgraded lighting and installed back-ups to all systems, leaving superyacht Magic Time in a ready-to-go condition. Her full-beam owners' cabin aft features a bath, shower and a treadmill that pops up from the floor when desired. She accommodates six crew and six guests. The yacht’s twin diesel NT855M Cummins engines offer a 2,500-nautical mile range at nine knots, and Magic Time has proved her mettle on a number of serious journeys, including two transatlantic crossings. Lying in Fort Lauderdale, Florida, Magic Time is down from $1,895,000 to $1,495,000.